Gather 12 people with modular synths. Put names on papers, put in hat. Draw 6 duos for the first round, draw 4 trios for the second round. Announce the 6 duos, if desired let each duo prepare their clock sync. FIRST ROUND: allow the 6 duos to perform an improvisation of 10 minutes each. Allowing a 10 min break between duo 3 and 4. Announce the trios, if desired let each trio prepare their clock sync. SECOND ROUND: allow the 4 trios to perform an improvisation of 10 minutes each. Allowing a 10 min break between trio 2 and 3. Prepare for a mass modular improv orchestra. If desired let participants prepare their clock sync. GRAND FINALE: allow all participants to perform a mass modular improvisation of 15 minutes. Have a beer to celebrate. Gather 4 to 12 participants. If as little as 4 people participate, one can give participants more than one slot per round. I set 12 as the maximum, trying to find a nice balance between ‘listening’ and ‘participating’ for everyone. The main instrument should be a modular synth, or at the very least a semi-modular synth. Peripherals and other instruments are allowed, but should only be used to accompany the (semi-)modular synth. Come as you are…patched…unpatched. Whatever works for you. Setup all the modular synths in the room in relative close proximity to each other. About the draw: put each name of the participants on a separate paper, fold it and drop it into a hat. The host will first draw 6 duos for the first round, then draw 4 trios for the second round. Observe silence in the audience during the performances. I had some ideas to maybe use a throw of the dice to determine the clock tempo/bpm and to determine the key/root note. But maybe I am creating too complex a structure and should leave these things for the participants to decide? Please give me your feedback and feel free to share your ideas on how to make this a great experience for the participating artists as well as for the audience. Thanks in advance for your help. Very much appreciated! Ten minutes seems pretty short, which could be both good and bad. Depending on what kind of music your participants make with their modulars, you may want to build in time for tuning. I’d almost be more interested to see a mix of modular and non-modular performers in such a performance as well, but I guess that might be a constraint you want. Thanks for your feedback. 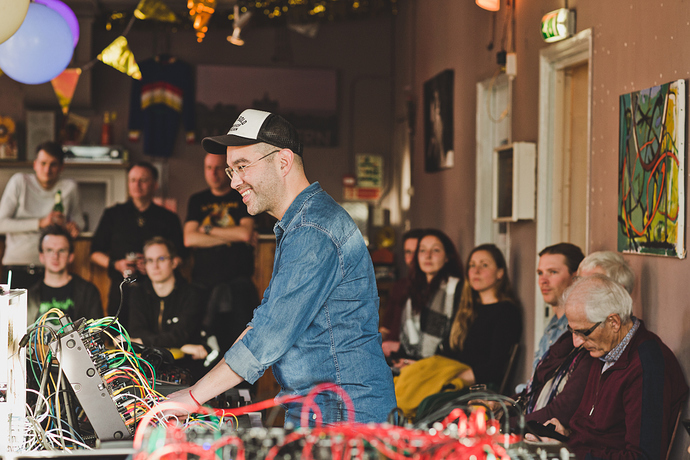 Recently I participated several times as ‘one of the two modular guys’ with a lot of non-modular performers (hobo, piano, guitar, vocals, drums, saxophone, percussion, flute, bass). This was great fun indeed! Now see if I can transpose the concept to modular synthesists and have the same amount of fun. I have noticed in many improv sessions I have participated in that without structure, it can take up to 45 minutes for a group to fall into a groove, and 2 hours to play through a jam. If you want things to be tighter, you’re going to need some more structure. I’ve done lots of this type of thing, and, regardless of how planned or unplanned, they’re always great fun. always have plenty of every type of audio cable on hand and adapter possible, 1/4" -> 3.5mm, joiners, splitters, mono to stereo, this to that, MIDI, etc. People ALWAYS turn up with the wrong cable. people will NOT be quiet! they’ll want to chat, etc. encourage people to collaborate by listening to each other and responding. a lot of modular cats have a tendency to fire up giant walls of sound and try and dominate (which is fun in its own way). get some video / lighting in as well, sync’d to the modular. really adds to the vibe. Definitely go for it. Great fun. ps : people tend not to follow guidelines. Most of the time you can control tempo and that’s about it. Many modularists don’t stick to things like defined keys or reference tuning. Thanks for your replies. Relevant stuff. I actually like the crazy short time constraint? But shorter is way better; that’s a long event as is. It won’t work for everyone, but if you know you have 10 minutes going in, you can practice for that. People definitely need to be more familair with what their live rig can do, but I’d be much more inclined to go to an event like this with a shorter time table. Especially accounting for inevitable downtime due to random technical hiccups. The nice thing about 10 minutes is you can fail super hard, and it’s no big deal. You’ll have another shot in a short while. Thanks. That is exactly why I opt for 10 minutes. The art/jazz improv’s I did were all 17 minutes. I found that a bit too streched most of the times. I’ve got a regular improv session with a guitarist with a goal of creating finished tracks. We started out just hitting record at the start of the jam and hitting stop 45 min to an hour later. It was a real pain to find the good parts and edit with a session that long. Never quite as many good parts as you’d hope. So we switched to 5 min recording blocks. It can feel a bit short at times but if we like what’s happening, one of us gives a nod and we keep playing. A couple years ago I was participating in a completely unstructured jam in LA called sound shoppe. It could be a lot of fun but much depended on the number and mix of people. Fewer people was better in my opinion. Easier to listen and respond. It still happens monthly for anyone looking for an activity. I think it’s been going on for years if not over a decade. Organized by a real nice guy, Joe Potts I believe. If everything will be already connected etc. then I don’t think that 10 minutes will be too short especially that there will be a lot of others duos playing etc. I think that between 10-20 minutes is good. We have an event here where people are grouped into trios etc on the spot by lottery as in your idea and we have 20 minutes limit on performances. And I really like @ether advice to "encourage people to collaborate by listening to each other and responding. a lot of modular cats have a tendency to fire up giant walls of sound and try and dominate (which is fun in its own way). ". That is one of the reasons why I stopped going to more traditional jams because almost every time it ended in bunch of local guitarists playing never ending solo. My ideal jam would be where people create songs on the spot and I think that encouraging people to collaborate is a good way to achieve that. 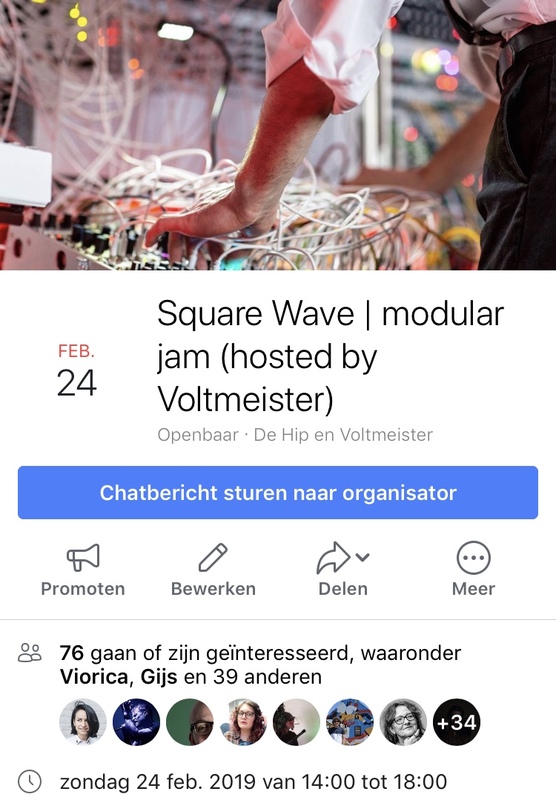 Also some extra: if possible try to invite some VJs to the improv or take into account lightning in the space that you will be playing to create some ambience. I think that I can really change the perception of music especially if it is more abstract as modular music tends to be. Edit: and about “Prepare for a mass modular improv orchestra”: from my experience it is good to have someone that will act as a conductor in such orchestra. Musicians that I met have tendency to play all the time and it can get really out of hand if more than 4-5 people are playing. participants will do 4 improv jams of 10 minutes each. Twice as duo, Twice as trio. duos and trios will be randomly matched by blind draw. bpm will be provided by blind draw (range 70-135bpm). we’ll provide central clock and reset signal. venue is awesome. A bar on the top floor, overlooking the main square of the city. Thanks for all the replies and tips so far! i’m cooking up a structured improv concept of my own that is similar to yours in many ways. how did your first event go? what worked/didn’t? will you be doing it again? Duo improvs proved to be more fun than trio improvs. I’ll drop the trios next time. Working with a central clock and reset signal and setting this up prior to the start of the event made change-over smoothless. Sending out a clear briefing to all participants beforehand ensured they understood the concept and the practicalities of the venue/parking/etc. (I’d be happy to translate and send it to you. Please let me know). Doing the draw of the duo’s and bpm in the room with full audience is exciting and fun. This emphasized the improvisational character and felt…for a lack of a better word…imminent/live/real. The audience could sit around the performers/participants. Very often they changed seats during change-over. This kept people interested as they could observe and listen from various angles. The audience was VERY QUIET and concentrated during improvs. 10 minutes proved to be a good length in that respect too. I recorded all improvs and shared the recordings with the participants afterwards. A few appeared online on their private SoundClouds. Participants were very excited about the concept and the results. I will for sure do this again and am now negotiating two new dates for May and June. New people contacted me to tell they want to participate. Please keep me up to date on your activities. It’d be awesome if this concept brings joy to other members of the community. thank you for the detailed reponse! i love the duo drawings idea, and the shared BPM seems like a must-have for modular improv. i’m still working out some of the details for my improv concept, but i’ll let you know if i have any other questions! keep an eye out for a similar thread soon. Cheers man! I will keep an eye out.